The mass protests that erupted in Egypt in 2011, and their aftermath, were dubbed ‘a revolution’ by both opponents and proponents. The label, on the one hand, has been used to discredit the protests; described as a destructive force that is the reason for the abysmal state of the Egyptian economy. On the other hand, the same label has also been used to romanticize the struggle against the Mubarak regime and its successors. A more sober examination of the nature of these events renders a different picture. It places the upheaval within a reformist rather than revolutionary realm that had aimed to pave the way for the development of Egyptian capitalism beyond the cronyism that had plagued it for several decades. However, a distinction needs to be made between social and political revolutions in order to identify the position of Egyptian mass protests either within this continuum or outside it altogether. A social revolution can be defined as a process of societal upheaval by which one society replaces another, and one class the other at the helm. It represents a clear rupture by which the form of society drastically changes. The classic example of which, at least based on the Marxist tradition, is the French Revolution. The bourgeoisie were able to capture the state and overhaul the political structure in a manner that removed remaining feudal fetters on capitalist development. On the other hand, the outcome of a political revolution involves a change in the nature of government or the political system with limited impact on the society at large, and sometimes with limited popular participation. The English civil war of 1640 and the Glorious Revolution of 1688 can arguably fall within this category. Thus, the goals as well as the outcomes of a revolutionary process classify events of mass upheaval as either political or social. However, one needs to take into account that a revolutionary process is complex and involves a large number of social forces with conflicting aims who are not always historically conscious of their mission. The French revolution, for example, started as an inter-elite split with moderate reformist aims. Through popular participation it turned into a radical social revolution, and the task of paving the way for capitalist development was not carried out by the bourgeoisie but by the popular classes. The same applies to the English civil war. Even though the monarchy was eventually restored, it performed a bourgeois rather than feudal role, acting as a surrogate for bourgeois rule. When one looks at the core of the Egyptian mass protests, namely the youth and secular movements that were anchored in the urban middle class or what can be called the petty bourgeoisie, one can see that their demands mainly revolved around political reforms with little social content and limited change in the structure of government. The “We are all Khaled Saeed” Facebook page, one of the largest groups that called for protests in 2011, had a core message of combating police brutality. However, they had limited demands for political reform. As a result, this group quickly faded after the initial wave of protests. On the other hand, as Mubarak was deposed and the struggle continued, it was against the Islamist current, most notably the Muslim Brotherhood, as well as the military. It revolved around the role of Islam in the political system as well as democratic reform to establish a system based on free and fair elections. The goal was to establish a system whereby the coercive power of the state would be restrained and government corruption would be fought. A liberal democratic regime that would allow for the development of another type of capitalism, one based on competitive capital accumulation rather than state subsidies and political support, was sought. A brief overview of the development of Egyptian capitalism since the coup of 1952 will elaborate this point. The coup of 1952, which brought the Nasser regime to power, initiated a period of state capitalism while all other centres of economic power were eliminated. The land reform act was one of the tools used. The Nasser regime broke the power of the landed elite, who constituted the leadership of the political class pre-1952. This was followed by the sweeping nationalization of the private sector in the 1960s. Surplus extraction was concentrated in the hands of the state. Towards the end of the 1960s, the state capitalist model had suffered severe setbacks due to the military defeat of 1967, which exposed the weakness of the regime. Thus, after the death of Nasser and the emergence of neo-liberal dogma, Egyptian state capitalism degenerated into a form of cronyism, where a state-dependent bourgeoisie started to emerge. The most notable were the military officials, who transformed the military into the largest capitalist in the country. In this situation, the urban middle class were at the biggest disadvantage even though they were the backbone of state capitalism forming a growing bureaucratic elite as they staffed the public sector as part of the Nasserist social contract. However, the development of crony capitalism, backed and grafted by the state, created pressure on the urban middle class, as their job prospects and social status plummeted. The establishment of a liberal democratic system could have restrained this process of capitalist accumulation and state power. This does not mean that the urban middle class would have taken control of the state or directly attacked the crony capitalist class by confiscating their property. On the contrary, during the recent period of upheaval the protest movement was satisfied with handing over power to other forces, namely one of its greatest adversaries: the military establishment. This happened in 2011 and again in 2013. This has been reflected in the nature of the struggle and the form it took. For example, one of the main points of contestation post 2011 was the drafting of the new constitution, most notably the role of Islam and the role of the military. However, the military’s economic empire was not a strong point of contention. This shows the legal and political nature of the struggle and near to non-existent social nature. Another important point that needs highlighting is the urban middle class’ attempts to exclude the popular classes from the struggle. This was very likely out of fear of the possible expansion of the upheaval into a popular insurrection. In some cases, it was done passively, while in others quite actively. An example of passive exclusion was the marginalization of the peasantry from the political struggle, even though they had been subjected to severe repression and disenfranchisement due to the reversal of the Nasserist land reform act in 1992. 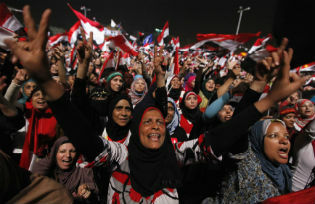 An example of active exclusion was the attack on a wave of worker’s strikes that had erupted after the fall of Mubarak in 2011, as they were supposedly disrupting the “wheel of production” and were believed to be harmful to the nation. This fear of the masses manifested itself and no radical left wing movement managed to capture the moment, unlike other historical instances when the demands of the masses were embraced and the process of change was pushed beyond its initial reformist goals. This has also made itself clear in the support the current regime enjoys within the urban middle class. This support is driven by fear of popular upheaval. This, however, does not mean that there was no popular participation, on the contrary, the popular classes did participate in the revolt, however, the urban middle class did not form cross-class alliances in order to take on the regime and enact drastic changes. Based on this, where does the Egyptian revolt lie? It would be very difficult to classify it as a social revolution, as discussed above. There are stronger arguments to classify it as a political revolution, since it aimed at changing the form of government. However, upon closer examination one can shed some serious doubts on this claim. For example, it did not aim at capturing the apparatus of the state, nor did it aim at enacting drastic changes in the structure of the state, especially with regards to the role of the military in controlling the state apparatus and its penetration of the economy. Even the notion of imposing taxes on military revenues, which are currently tax exempt, was never considered. Thus, the reforms envisioned were very narrow in nature and did not constitute what could be considered drastic political change. The Egyptian mass protests can only be classified as a reform movement, anchored in the middle class, which had hoped to create a liberal order with limited popular participation. A modest goal that has degenerated into a full-spectrum military autocracy.